The Parsonage had been bequeathed to the Congregational Church and Society (now the United Church of Craftsbury) on June 4th, 1879 by Deborah Worcester Loomis. The Parsonage served the church and community as home to some 24 ministers (and families). In the Fall of 2014, the Parsonage was donated to Sterling College by Rich Coyle and Sherilyn Peterson. It has two apartments for staff & faculty. North House is the former President’s residence, and is now a residence hall that practices communal living. With a wood fired pizza oven in the back yard and only a hop, skip or jump to the berry patch and Edible Forest Garden, North House is a wonderful place to live. Simpson Hall is home to our science labs, our largest classroom where we hold All College Meeting, the art space, a gym, an indoor climbing wall, and a number of other classrooms, as well as faculty offices. Formerly the Hearthside Inn, historic Kane Hall houses the David Behrend Admission Center on the first floor and faculty offices on the second and third floors. Kane connects with Dunbar Dining Hall and “The Barn” – a student lounge with a pool table, musical instruments, and plenty of space to hang out. The ample front porch of Kane Hall is a favorite place for students and faculty to sit and have a conversation while watching the daily flow of life in Craftsbury Common. Dunbar is our dining hall, where students, faculty, and staff eat meals together and hold Community Meeting. Dunbar was constructed in 1962. The senior class of the boys’ school put up key structural components, in cooperation with a local construction company. The building is named after the Dunbar family, as appreciation with securing the loan for construction. Madison House faces Kane and Dunbar Hall and houses up to 25 students. Coin-operated washers and dryers and a root cellar are located in the basement of Madison. Mager Hall our main administrative building. It is named for Dr. Milton Mager and his wife Dorothy Mager, in honor of their dedication to education through experience and the art of making a difference in the world. Mager Hall has two classrooms on the first floor – the Rachel Carson room and the Aldo Leopold room. The President’s Office, Advancement Office, Communications Office, and Business Office are on the second floor of Mager Hall, along with the Trustees Room, a space used for meetings and seminars that features a hand-crafted table designed, made, and donated by Keith Gorges ‘ 85. Merlin is a residence hall that houses up to 25 students. Lounges are located on both floors and a coin-operated washer/dryer is located on the first floor. Major renovation was completed in the fall of 2000. Merlin is also home to the Wellness Center where a physician’s assistant/nurse is available during scheduled hours to consult on matters of general, physical, or mental health. An integral part of Sterling’s core curriculum, the Tool Shop is where we house and maintain our gear. We make our own maple syrup using our draft horses on campus from over 200 taps in our bird-friendly sugarbush. Built of cordwood, this small shop is used most frequently for green wood working. Located near the Alfond Forge, some Farrier Science happens here too. This 36 x 40 foot facility for our draft horses was made possible through the generous support of the Peter Alfond Foundation. Deborah Alfond ’13 was on hand for its unveiling in October 2014. The Rian Fried Center for Sustainable Agriculture & Food Systems was named for the late founder of Clean Yield Group Inc. and a Sterling College Trustee. The facility encompasses the Farm, the Alfond Draft Horse Barn, the hoop house, the McCarthy Barns, and is the centerpiece of the College’s nationally known Sustainable Agriculture & Food Systems programs. These barns were originally built in 1989 to honor the spirited commitment and lasting contributions of John McCarthy Jr. ’62. John was a graduate of the Sterling School and served as the Chairman of the Sterling Board from 1978-1986. Designed by Sam Russell, an alumni parent and former member of the Board of Trustees, and built chiefly by students and faculty, it consists of the renovated Carpenter House and its garage, with a connecting gallery. A cozy Reading Room with comfortable furnishings offers “a room with a view” of Mount Mansfield and beautiful sunsets. This room also provides a space for special evening workshops and events. The Library is named for alumni parent and former Board of Trustee Chair Marvin Brown. Houston House, a residence hall, is next to the Brown Library. Formerly one part of the Inn on the Common, the building includes a student lounge, dining room and extensively landscaped grounds. Houston House is the home base for Sterling’s summer short courses in sustainable food. The official dedication of the Shelton-Flynn Garden was on August 15, 2014. The College dedicated this garden in honor of Bob Shelton’s service as the former chair of the Sterling College Board of Trustees, and in honor of both Bob and his partner Mark Flynn’s service to the greater Craftsbury community. Cedar Cottage is the President’s residence. It was purchased in Fall of 2014, and was previously the home of the late trustee Penny Schmitt. South House has come full circle as a residence hall. In the 1960s and early 1970s, South House was a residence for the students of Sterling School. It then became a part of the former Inn on the Common. Starting in Fall of 2013, South House is once again a residence for Sterling students. The Fiber Annex is home to Sterling’s fiber arts program, a central part of the Environmental Humanities curriculum. The Annex is located next to South House and across the street from Houston House. It overlooks a small wetland bisected by a nordic ski trail. Home to some pastures for livestock, trails for exploring and logging and some lean tos where many students enjoy sleeping out under the stars. This is also where the Coyote Kids program, a nature program for elementary school students, hold their classes. Virginia Russell, former Chair of the Sterling College Board of Trustees, is the steward of a 27 acre woodlot and pasture on the southern edge of the Sterling College campus. The woodlot includes many sugar maple trees, and is therefore known as a “Sugarbush.” Each spring, students collect sap from the maple trees, transport it to the sugarhouse on campus with help from draft horses, and boil it down into delicious maple syrup. The Virginia Russell Sugarbush also includes a ski trail, an array of tree species, and excellent winter habitat for white-tailed deer. The western edge of the property is an open pasture that is grazed by farm animals and used for student research projects. Sterling College has a 30 foot climbing wall on campus, located near the “Lower Dorms,” Hamilton and Jefferson. Here, students are presented with a history of rock climbing, as well as being trained on the ground in knots, rope-handling, and belaying. On the wall itself, students practice balance, movement, and technique, as well as get introduced to rappelling. Outside of class time, the rock wall is available for students to practice in their free time. Learn more about the course Challenge Course I to get a feel for what you will do out here. Hamilton and Jefferson Houses are two residence halls located on the “lower campus.” Surrounded by fields and adjacent to Cedar Swamp, these residences are a short walk from the main hub of campus. Each residence has rooms for up to 16 students, plus a faculty apartment. Both Hamilton and Jefferson underwent extensive environmental renovations in Summer 2011. Sterling student, Mckenzie McKann, loves her life in Jefferson and wrote a blog post about it. Read it! Sterling grows more than 20% of its own food and the Lower Gardens is where a great deal of that happens. Students studying Sustainable Agriculture & Sustainable Food Systems can expect to spend a lot of time here and everybody at Sterling benefits from the work that happens here. The Common is central to the Sterling campus. Year-round you can find students, faculty and staff, and the greater community enjoying time on the Common. 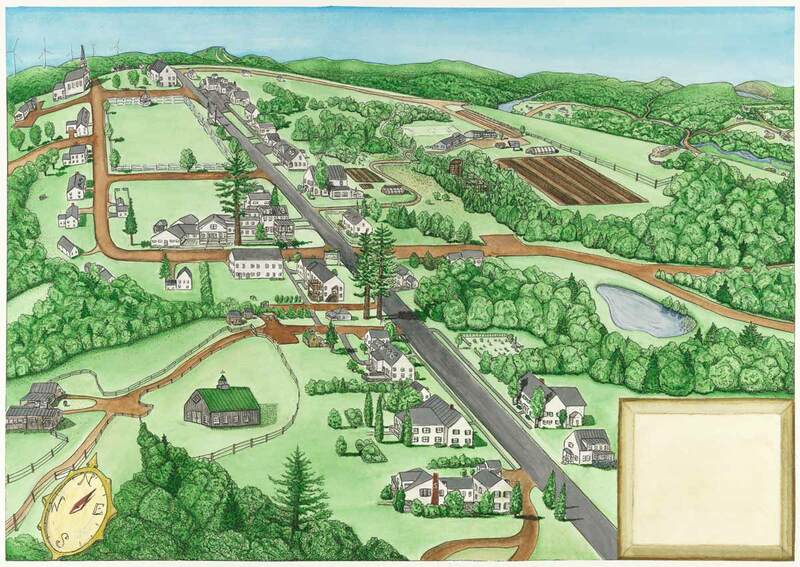 The Craftsbury Farmers Market, summer concerts, pick up kickball games, Antiques and Uniques and the return of Expedition are just a few of the fun things that happen there. Common House is a classroom during the day and a gathering and meeting space for the entire community. This space was Craftsbury Common’s original library and later was the Galaxy Bookstore. Got 15 minutes? Take a (video) tour of campus with Tim Patterson, Dean of Admission & Financial Aid. Come and see for yourself if Sterling is right for you!